The Russo brothers want you to look hard at an incredibly vague Avengers 4 set photo. Aubrey Plaza and Bryan Tyree Henry could be joining the Child’s Play reboot. Pennywise has a close encounter with Bill Hader in new It: Chapter 2 set pictures. Plus, what’s to come on Arrow’s return and the debut of Charmed. Spoilers get! A new set photo from Joe and Anthony Russo encouraging fans to “look hard,” has led several Avengers obsessives to imprint different, arcane meanings onto the image. Among the proposed theories, all equally wild in their absurdity: four hidden A’s, the word “Endgame,” and a prop from Infinity War that could play a part in defeating Thanos. 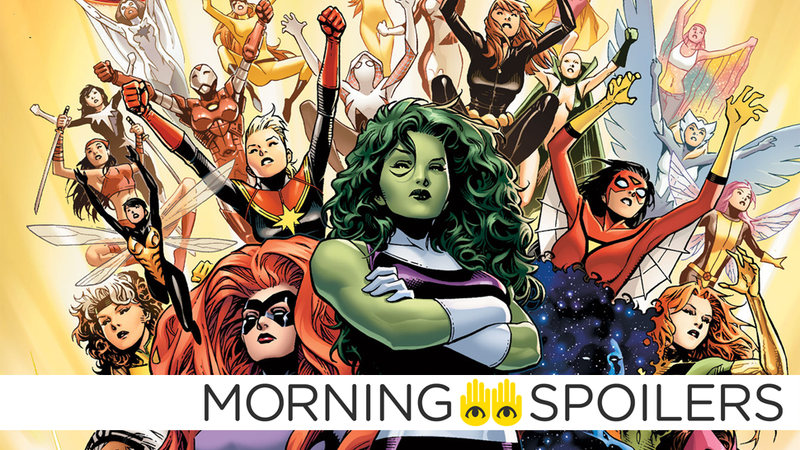 Details are scarce but Deadline reports ABC has ordered a new hourlong drama focusing on Marvel’s roster of female heroes. Wonder Woman’s Allan Heinberg has been hired to write the pilot episode of the currently untitled series. The Daily Mail has set photos of Tom Holland and Zendaya filming in Prague. Head over there to take a look. Elsewhere, Pennywise spooks Bill Hader in a pair of set photos from the It sequel. Bloody-Disgusting has another new poster for the Suspiria remake. IGN talks to the visual effects crew about bringing Venom to life in a new video. A full track from John Carpenter’s Halloween soundtrack has been uploaded to Youtube. A music video for “Zero,” Imagine Dragons’ end credits song from Ralph Breaks the Internet has also hit the ‘net. The son of a famous magician killed on stage is implicated in a series of murders in the first trailer for Abrakadabra, the latest giallo pastiche from the Onetti Brothers. Coming Soon reports the new Harvey Birdman half-hour special is scheduled to premiere October 14 at midnight on Cartoon Network. A dramatic new poster for season three plants Daredevil’s mask precariously on a tombstone while quoting scripture. Entertainment Weekly has our first look at Inbar Lavi as Eve on the new season of Lucifer. A teammate assumes the mantle of Green Arrow in a new trailer for season seven. Jessica Lange returns as Constance Langdon on Ryan Murphy’s Instagram. Finally, the CW has released a full minute-and-a-half trailer for the Charmed reboot.